Today I’m talking about a very well known recipe in the US (in the entire world, actually), the Genovese Pesto. 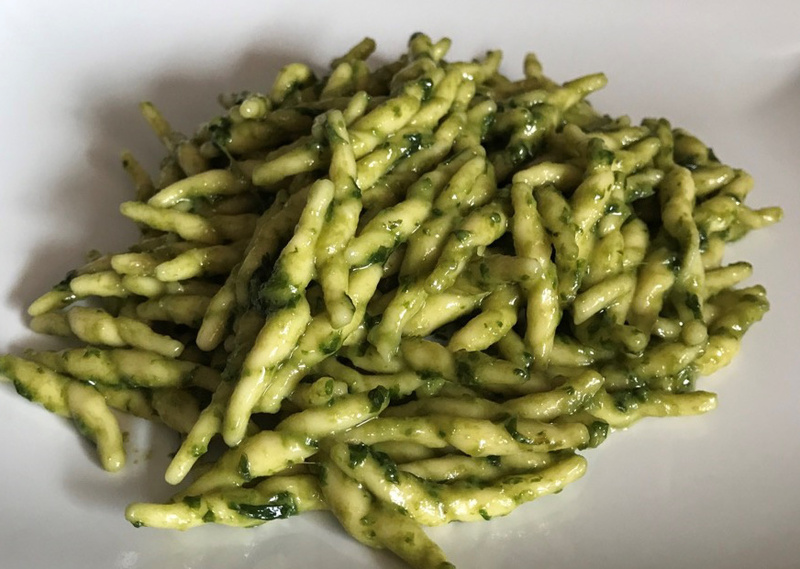 Since I love to stick to traditions, I’m going to make the standardized recipe for Pesto Genovese, as per direction of Consorzio del Pesto Genovese. You can check their site for the recipe and other historical facts. The ingredients are few, but must be the highest quality possible, with the basil possibly coming from Liguria (ok, that’s a stretch for foreigners, I know), and Pecorino DOP from Sardinia. The Pecorino from Sardinia is less aged, and probably less salty than the Romano one. I understand the difficulty of finding the original ingredients, so try to balance the salt in case you use the Pecorino Romano and try to use very good quality basil. There’s one basil that I personally think will always fit for the sauce, the one from your own garden. The olive oil should be gentle flavored, soft, to tie all ingredients without altering the sauce too much (olive oil from Liguria is exactly the kind you’re looking for, obviously). Again, this sauce is very simple in ingredients, so it’s worth it to spend a little more to get very high quality ones. The traditional recipe for Pesto Genovese. Clean the basil leaves with cold water then dry them gently. The pesto just before adding cheese. Note the green color (photo untouched). Add the cloves of garlic with the grains of salt in the mortar and move the pestle in a circular movement until the garlic becomes a paste. Add the pine nuts and keep going. Then add the basil leaves, a few at a time. Keep using a circular movement, you want the leaves to be torn up, not smashed by, the wooden pestle. The moment you have a green, wonderful smelling paste of basil, will tell you it’s time to add the cheese to the mix, and later the oil, one drop at a time, to ease the mixing. The sauce is ready. Boil some Trofie (the traditional pasta for pesto Genovese) in slaty water, drain them, and add the pesto at room temperature. If it’s too thick, use a little water from the pasta, to create the perfect density. I love your post, I didn’t even think of giving directions to store the pesto in the fridge, good job!